Just so we're all the same page, the common parts of any rebuild kit are: A complete gasket set, Liners, Pistons, Piston Rings, Rod Bearings and Main Bearings. Of course other items may be changed at the time of a rebuild such as Injectors, cylinder head, oil pump, etc. but they are not considered part of the rebuild kit. Highway and Heavy Parts offers two categories of kits to cover leaving pistons out or adding them to a rebuild kit. The two categories are "Re-ring Kits" and "Standard Rebuild Kits". The only difference between these two kits is if you get the pistons or not. Otherwise, all the included parts are the same. The price difference however can be over $1000. Again, pistons are the most expensive part of any rebuild kit. To be general the three types of pistons we regularly run into on Caterpillar, Cummins and Detroit Diesels are either one piece aluminum, two piece steel and aluminum or one piece steel. 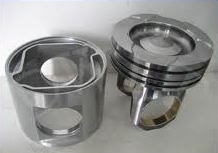 The one piece aluminum piston is found on older and lower horsepower engines. On the good side, aluminum is light, and that's about it. The draw backs to aluminum pistons are strength and thermal expansion. Strength is fairly obvious. Aluminum is softer than steel and won't stand up to high cylinder pressures. Thermal expansion is when a part heats up it expands. Because aluminum and steel have different rates of thermal expansion, aluminum pistons are more likely to scrape the liner, or worse seize altogether. Two piece steel and aluminum pistons attempt to make the best of both worlds, the light weight aspect of a one piece aluminum piston and the durability of a steel piston. This is a great setup and very strong. It is found in a majority of the truck on the road today. The drawback to this setup is still the aluminum skirt. The skirt is prone to scoring and will wear much faster than the steel crown. 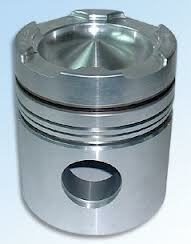 One piece steel pistons, also referred to as monotherm, are the latest and greatest. These pistons are all steel, light weight, and under normal loads don't show any wear even at the million mile mark. Many competition engine builders have switch to this style of piston for every engine they build. Ok, so those are the piston options you'll find in many rebuild kits. What you have depends on the make, model and serial number of your engine. 1. 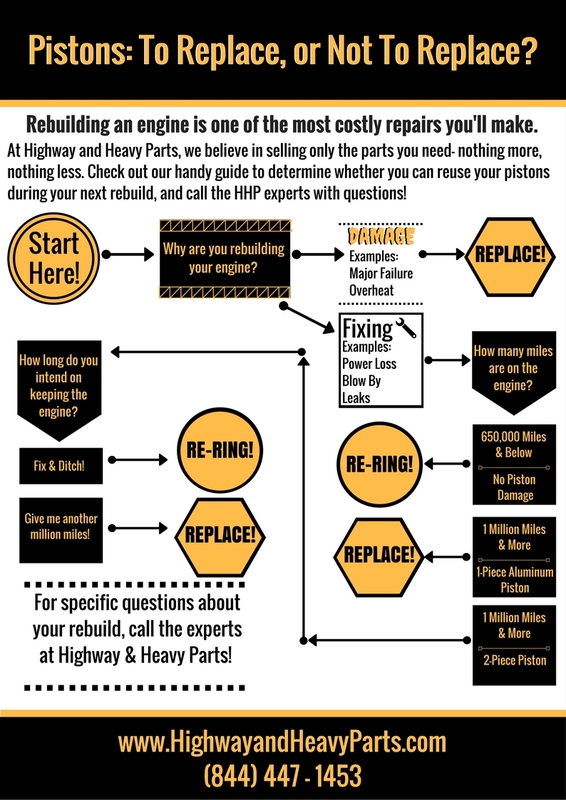 Why are you rebuilding your engine? If you had a major failure, overheat or damaged your pistons in any way, change them. Don't ask questions, just do it. If you're fixing power loss, blow-by, or leaks, a re-ring kit may save you some money. See question 2. 2. How many miles are on your engine? If you're at 650,000 miles or below and you had a failure that didn't damage any pistons, a re-ring kit is all you need. If you're at the million mile mark and are rebuilding your engine due to power loss or blow-by, a re-ring kit is usually all you need. That is if you have either a two piece piston or a one piece steel. If you have a one piece aluminum piston, change them. Re-Ring kits for the two piece piston include the aluminum skirt so the only piece to reuse is the steel crown. Many repair shops, the guys who build engines every day, reuse pistons on more than half of their rebuilds. Here's another secret, many of the OEM manufactures also reuse the pistons in their overall kits. It's not as unheard of as you may think. See question 3. 3. How long do you intend on keeping your engine? If you going to fix and ditch your engine, don't put more money in it than necessary. A re-ring kit will do the job. If you just put on a million miles and want to put on another worry free million a standard kit with pistons is a good way to. Having 2 years of warranty with unlimited mileage on your rebuild is something that can help you sleep at night. See question 4. 4. How much money do you have to put towards the rebuild? If you don't have the extra money to put towards a rebuild, buying a re-ring kit maybe your only option. Our staff will always try to help guide our customers on what's the best way to get out of a tough situation. 5. What application do you use the engine for? An over the road truck pulling 40-60 thousand pounds has a much easier life than a gravel train pulling close to 160,000 pounds. A dump truck driving around a sandy gravel pit all day has a much different life than a Gen-set sitting out a hospital. The harsher the environment the more you should look at spending the additional money for new pistons. For heavy hauling and rough service, a standard kit with pistons is the way to go. Click here to download and print a PDF copy!